Athletes from Russia are trendsetters in artistic and rhythmic gymnastics, figure skating, trampolining, acrobatics, and diving. 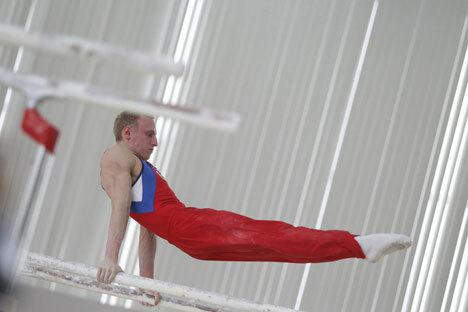 In the final round of the 2013 World Championships, Balandin earned the highest difficulty value of all the competitors in the rings category, at 6.900. He did the same at the 2014 European Championships in Sofia, Bulgaria. Balandin has three core skills named after him: the Balandin 1, Balandin 2, and Balandin 3. The Balandin 1 entails moving from a hang vertical pull-up with straight arms to a Maltese cross. The Balandin 2 means moving from a hang vertical pull-up with straight arms to an inverted cross. Finally, the Balandin 3 – debuted for the first time at the 2013 European Championships – involves a hang vertical pull-up with straight arms to a planche (in other words, Balandin holds his body parallel to the floor). The gymnast attributes these tricks to overindulgence during training. “When you are in a good mood, your form and everything else works out; you always have the desire to move forward and try new things,” says Balandin, describing the history of the Balandin 1. “It was in this state of excitement that I ended up with the element that now carries my name in the rules. Konstantin Menshov, a veteran of the Russian national team and bronze medalist in the men’s singles at the 2014 European Championships, has skated the most complex programs for many years. When he first began his career 15 years ago, he found himself behind the powerful backs of Alexei Yagudin and Evgeni Plushenko. In fact, the Figure Skating Federation of Russia said he had no future. However, Menshov demonstrated phenomenal obstinacy, breaking through the wall of mistrust for more than a decade and eventually establishing his place on the Russian national team. Menshov’s impressive repertoire includes two quadruple toe loops (one in a cascade with a triple toe loop) in the long program. At the 2014 European Championships, the figure skater earned the bronze for performing - in addition to his signature moves - two triple axels (one in a cascade), a triple lutz, a triple Salchow, a triple loop in a cascade with two double toe loops, and a double axel. Only two athletes performed a more difficult set last season: Spaniard Javier Fernandez and Canadian Kevin Reynolds, who performed three quads in a single program. This season, the 31-year-old St. Petersburg native has added maximum complexity to his content. In addition to a quadruple toe loop in a cascade with a triple toe loop and triple axel, Menshov has planned a quadruple Salchow for his short program. He is also adding a quadruple Salchow to his long program. All that remains is to perform this entire set at the most important competitions. Russia also has record holders in individual figure skating elements. Yuko Kavaguti and Alexander Smirnov, the 2010 European pair skating champions, have only just returned to the sport after Alexander suffered a serious injury (he tore his knee ligaments at the very beginning of the last Olympic season and only just started training again last summer). The St. Petersburg duo’s core element – the quadruple Salchow throw – is unique for its difficulty, although the pair rarely performs it due to the high risk of falling. Kavaguti and Smirnov recently performed this Ultra-C (ultra-complicated) element at the Nebelhorn Trophy in Oberstdorf, Germany, executing it almost perfectly. And by the way, the pair won that tournament. The near future is expected to feature record-breaking complexity in diving by Russian athletes. Today, 2012 London Olympics gold medalist Ilya Zakharov and silver medalist Evgeny Kuznetsov can perform the most valuable diving skill in the 3-meter springboard (5156B) – 2.5 forward somersaults with three twists, with a difficulty coefficient of 3.9. Reigning European champion Viktor Minibaev, who competes in the synchronized 10-meter platform, plans to master a combination at the upcoming World Championships that is unique for its difficulty (4.3 coefficient) – 5257B, with 2.5 backwards somersaults and 3.5 twists. For comparison, the reigning world diving champion, Chinese diver Qiu Bo, now dives a front 4.5 pike with a difficulty coefficient of 4.1.